Help us write the next, great chapter. Give Purple! The College of the Holy Cross is, by tradition and choice, a Catholic, Jesuit liberal arts college. Since 1843, Holy Cross has sought to educate students who, as leaders in business, professional, and civic life, live by the highest intellectual and ethical standards. From the day our doors first opened to students, on November 1, 1843, Holy Cross has devoted itself to transforming lives in the hope of transforming the world. For 175 years we have pursued The Magis with passion and resolve. Together, let us continue to write the next exciting chapters of our story. For exactly 1.75 days, for every 1,000 donors, the College will receive $250,000 from a generous group of alumni and parents. This June, use your gift to change the world by helping a new generation of Crusaders. Every gift, no matter the size, makes a difference! 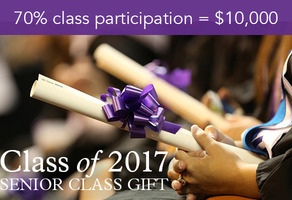 Help the Class of 2018 break records and reach 70% participation - $10,000 is on the line! We Are Holy Cross Crusaders! 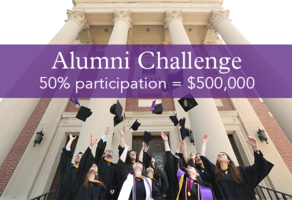 On April 6th, for every 1,000 gifts the College receives, a group of alumni and parents will donate $250,000 to multiply the impact. 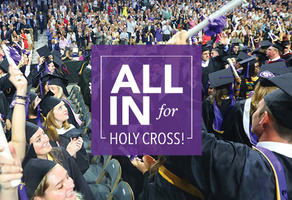 A group of alumni will give $500,000 to the Holy Cross Fund if 4,344 more alumni make gifts by June 30th! Show your support today! $10,000 is on the line! 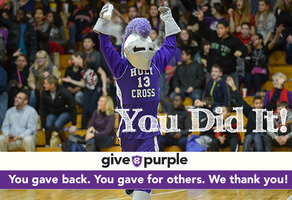 Honor our time at Holy Cross and help the Class of 2017 reach our goal of 70% class participation! 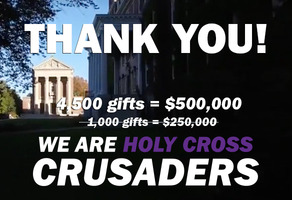 If 4,000 members of the Holy Cross community make a gift on Valentine's Day, HC will receive $1 million. Show Your Love. Give Purple! $25,000 is on the line. Please make a gift today to honor Dean Paco and help 2016 reach 60%! A group of friends from '82 will give $500,000 if 2,500 members of the HC community make a gift. Give back. Give for others. Give Purple. 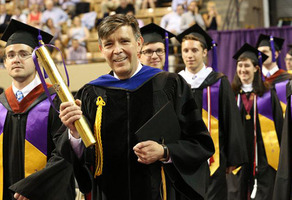 Make an impact at College of the Holy Cross!